United States Mint from 1851 to 1889. Two different three cent pieces were made during this time span: The three cent silver (1851-1873) and the three cent nickel (1865-1889). These unusual coins were first introduced to try to put some coins back into circulation as silver coins were being hoarded because they were worth more for the silver content than their face value. This caused a shortage of coins needed for day to day purchases. Government officials decided to introduce a coin that would be considered valuable to people but not valuable enough that they would hoard them or melt them down. 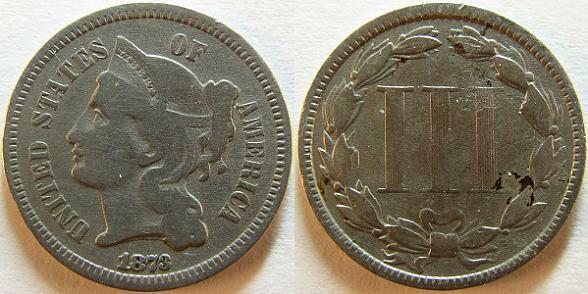 So, the three cent silver, made of 75% silver, was produced to try to get more coins into circulation. The silver three cent piece was a very small coin. In fact, it is the smallest US silver coin ever made. It's silver color, along with it smallness of size earned it the nickname "fishscales". At about the same time, postage rates were lowered from five cents to three cents so it was decided that a three cent coin would be a good choice. Note: The Coinage Act of 1964 gave the cent and nickel full Legal Tender status. Coins or currency which, by law, must be accepted as payment of a debt. during this time, they were not accepted for postage purchases. At the same time, people did not want to let go of their silver coins to purchase postage because they knew they would probably get copper one cent coins as change, so the three cent silver coin was welcomed. 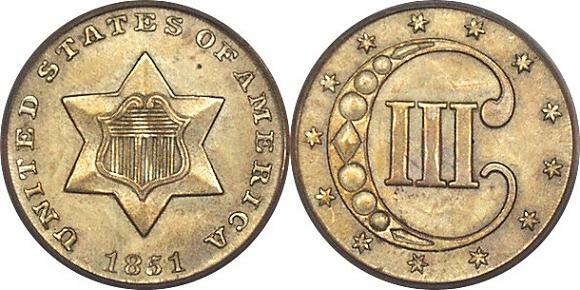 This three cent silver coin was made until 1873, and was also referred to as a trime. A three cent nickel coin was introduced in 1865. It was produced by the Philadelphia Mint until 1889. 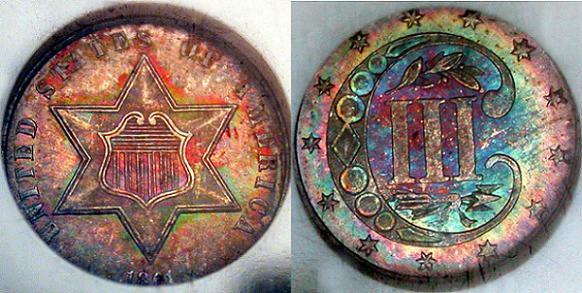 It was a little larger than the trime and was made of a copper-nickel (75% cooper and 25% nickel) alloy. It was about the size of a modern dime and was called the Three Cent Nickel.